three instruments sharing the same pitch. three performers determine a common pitch. the duration of the performance is not determined. the performers do not use a watch. two of the performers play the pitch, lasting three to seven seconds, once during the duration of the performance. the pitch lasting three to seven seconds sounds once, twice, or three times during the duration of the performance. The other works in the series have the same score format. Mostly, the number of performers varies (from one to three), as well as the number of sounds to be performed (never more than three). Interestingly, when one closely scrutinizes all of the scores, each turns out to have its own, particular musical logic, even though the sonic results are likely to be very similar. Each of the scores is a carefully crafted minimal essay on musical (inter-)action. The situation described above is a case in point. Even though a performance of Stück 20031 might end up sounding exactly the same as a performance of Stück 20043, they are not the same piece, and the musical event itself would not be identical. What kind of musical event is it, that does not express itself exhaustively in the way it sounds? Perhaps the moment in the performance at which this difference is the clearest is the final silence. Were the performance sketched above one of Stück 20031, the third performer would have no choice to play a sound anymore. But in the case of Stück 20043, there would be four possibilities: no more sound, or any of the three performers could play one sound. Even if no-one would eventually end up playing, with the performance being sonically identical to one of Stück 20031, the musical interaction would be different. In the later piece, the musical situation would be more unstable, and the decision to end the performance would be a more far-reaching one, closing off more options. Even though this difference between musical situations might not be strictly audible, it could well be somehow sensed. Certainly, the musical event as such would be different, even if it is hard to pinpoint a material manifestation of this difference. In these two works, the space for interpretations is outlined with extreme rigor by the score, with only very few intentional sounds being allowed. Each of these however will have a major influence on the particulars of a performance. In this regard, the instruction to perform the sound “for itself. simple.” is perhaps the most complex element in the score, for if only two or three sounds get made intentionally in performance, how could they ever have the modest simplicity that this phrase suggests, how could they not be monumental? The atmosphere that results is one of a paradoxical waiting for the right moment in which to do something hardly special. A note played should at the same time be totally unexpected and totally common, collapsing the distinction between the artful and the everyday, between intention and non-intention. Performing, you just wait for yourself to be surprised by finding yourself, suddenly, playing. Pieces like these foreground the strangeness of action as such, in its simplest, most unassuming nakedness. most new music, these scores attempt to define an architecture of time so to speak ‘from the inside out’ – contrasting this with the more classical approach in which a score imposes a temporal structure, ‘from outside’, on the time of performance. This amounts to a specific category of musical temporality, which I will call action time. Indeed, one way to understand the two Werder pieces would be to see them as collective articulations of a temporal architecture. In Stück 20031, three performers collectively determine a structure of three silences, which may have any lengths; in Stück 20043, they determine, together, a structure of two, three or four such silences. Note particularly the role of the third performer in Stück 20031. It may seem as if the third player, who does not get to play a sound at all because the other two have chosen to play their sounds first, may play a role of lesser importance in the performance, but this is misleading. The musical responsibility of the third player is equal to that of the others. His or her contribution will not be sonic, but it will consist of (1) contributing to the atmosphere of attentiveness, by being present and listening, and (2) co-determining the length of the full performance. Even though silent throughout the piece, the performer is still required to perform this silence. In the typical performance practice of Wandelweiser musicians, this is done by maintaining a concentrated posture and a physically active relationship to the instrument, such as keeping the flute in hands, ready to start playing at any moment – also signaling that even though the performer does not play, he or she could have played, by way of which his or her sound contributes to the performance as a purely virtual part. Furthermore, since the length of the piece is not given in the score, it can only come about through agreement between all three performers (probably reached at by eye contact), and the responsibility of the third player for determining the entire temporal experience is thereby no more or less than that of the other two. Part of the musical task for the performers, then, is reaching this shared understanding of when the piece is over. The temporal structure of the performance is a collective action for which no criterium is supplied by the score, and to which every musician contributes. The naked simplicity of the temporal structure arrived at in performance means that individual contributions are all of the highest significance. In the most unassuming way imaginable, these works form full microcosms of a musical democracy, with all its openness, paradoxes and tensions. No doubt, the idea that musical performance is determined ‘from the inside out’ by the actions of musicians applies to all live music, not merely that of Manfred Werder or other experimental composers, and action time is just one dimension of musical time in general. Other temporalities might similarly be defined as dimensions of musical time, with potentially general applications, even though they arise most prominently in specific genres: phrase time (music conceived as a sequence of cadenced phrases, strongly determinant in tonal music), clock time (which becomes especially prominent when recorded music is played back by a digital device), divine time (in liturgy or cantus firmus based work), cyclical time, stasis, and so forth. The foregrounding of action time as a compositional concern can be traced back to the work of the composers of the John Cage circle. Within the work of Cage himself, action time appears in contrast to another form of time, clock time, as a polar duality. This is most strikingly apparent in the slightly less well-known sequel to 4’33”, the composition 0’00” (4’33” no. 2) from 1962. In a situation provided with maximum amplification (no feedback), perform a disciplined action, with any interruptions, fulfilling in whole, or in part, an obligation to others. No two performances are to be of the same action, nor may any action be the performance of a ‘musical composition’. No attention is to be given to the situation (electronic, musical theatrical). The first version of the score consisted only of the sentence, “In a situation provided with maximum amplification (no feedback), perform a disciplined action.” The score says nothing of the start or end of the piece or how long it is to last. Its timing is in fact entirely determined by the ‘disciplined action’ performed. Just as 4’33” was a perfect example of pure clock time, here we have a perfect example of pure action time. The main aspect of Duo for Pianists that remained absent from Cage’s thinking about action time in 1962 was the idea of interaction, the notion that the actions of a performer could be influenced by the actions of another performer through a cueing system. This is a dimension that Wolff’s music has concentrated on strongly. In works such as For One, Two or Three People, Wolff has developed a sophisticated grammar for (inter-)action in a highly idiosyncratic notation. 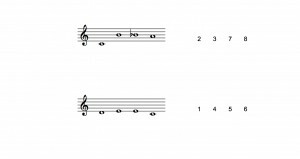 This bit, for example, is read as “immediately following another sound made by anybody, play a short sound, then fifteen seconds of silence, then another sound, followed by a sound involving tapping or touching or tracing which is exactly coordinated (beginning and end) with some other sound happening”. Notations of this sort float about on the pages of the piece and can be interpreted in any sequence. The timing of the piece is given by interactions between individual action times. When done as a duo or trio, performers constantly wait for one another, or cut one another short, or try to coordinate their actions, constantly shifting their relationships, with the musical form emerging from a process of live negotiations. Uncertainty, surprise, collaborations and quick reactions determine the piece’s often unruly rhythms and tense atmosphere. This particular category of action time might be called network time, in reference to the network of combinations and possibilities of actions that depend on each other, generating a particular quality of performer interaction. No overarching structure is given at all; the logic of how the piece unfolds in time entirely emerges from the gestures themselves. The grammar of actions used by the notation (based on elements such as ‘being followed by’, ‘short’, ‘long’, ‘coordinated with’, and so on) encodes the space of possible musical actions, the dimensions of the cells and the rules for their combination, out of which the temporal architecture of the performance is patched together, ‘from the inside out’4. This excerpt is from the third part (all parts are playable by all four instruments). The two- note phrase is to be begun between 2’00” and 2’22.5” into the piece and is to end between 2’15” and 2’37.5” into the piece. Thus, if played anywhere between 2’15” and 2’22.5”, the phrase could be as short as a second in length; but it could also be as long as thirty-seven and a half seconds, when started at 2’00” and played until 2’37.5”. This allows for a wide phrasing range for these two notes. Furthermore, the previous bracket could end at any point between 1’45” and 2’07.5”, and the next bracket start at any point between 2’30” and 2’52.5”. Both of these may or may not overlap with this bracket, meaning that there might be silence between the brackets (up to thirty-seven and a half seconds), or that the brackets might flow into one another, allowing for a wide range of phrasings between these two notes and the ones that precede or follow them. Thus the notation allows for the whole part to be phrased as highly isolated gestures, or an almost continuous flow, or anything in between. Even though the notes themselves are fixed, this does allow for an enormous variety of musical shapes and gestures. Nothing is left indeterminate in this music, except for the articulation of action in time. It is a compositional technique that seems to occupy a very strange temporality, at the intersection of clock time and action time. 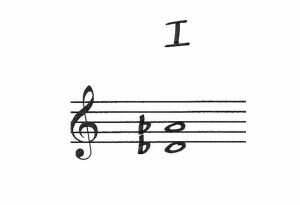 As in the pieces by Wolff and Werder described above, the notation here defines a grammar of possible action, a set of rules which shape the space of potential musical expression. The rules determine the possibilities for articulating motives, which determine the possibilities for phrasing in the parts, which together determine the space of potential contrapuntal architectures in the ensemble as a whole, which, in performance, emerges ‘from the inside’ out of the actions of the performers. At the same time, however, this entire fabric of potential performances is strictly tethered to stopwatch organization and clock time. This combination of time types gives the Number Pieces their highly mysterious quality, which is one of blurring time itself. It is as if Cage had found ways in which to inject another kind of time within clock time, opening up the fabric of strictly measured time to undecidability by strictly defining intervals of vagueness within it, and thereby adding a second dimension of variability to linear time. Time becomes a field of variations rather than a line. Of course, in practical performance, there will always be a single line drawn through this field, since the time that we live through remains linear. Yet the other variations can somehow be sensed. They are, as paths not taken, part of the performers’ actions and determine a quality of performing. They thereby remain active as virtual parts, surrounding the variation that is actualized with a halo of variations that might have been and which might have possessed subtly different expressive qualities, and these in turn confer onto the actual performance a spectral atmosphere, one of undecidable existence. What we experience is a shady projection into ‘real time’ of a larger, less tangible temporal field. Sounds and phrases seem to float in time, having a hesitant and precarious presence, rather than an emphatic and direct one – in certain works, Cage explicitly asks for the sounds to be ‘brushed into existence’. This is more than an expression of the sound quality itself. Fragility is part of the sound’s uncertain mode of being within time. Unlike in most other works with open structures, we do not hear clearly defined sounds that could take place at any moment – we hear sounds that are completely of their moment, but which have their beginning, their end, their duration and function in the the phrase made uncertain. Neither does the precariousness of the sound depend on improvisational whimsy of the performers. Indeed, the musical energy level of the pieces is highly determined, highly constant. Instead of having contrasts, they are rather governed by an consistent internal variability, woven out of consistently similar but variable actions. As in the Werder pieces, the musical event cannot be reduced to what is heard only. Things not heard, too, are part of the performance situation, and the actualized sounds and gestures are inextricably entwined with ones that remain virtual. This relationship between actualized time and the field of variability surrounding it, brought about by the action grammar of the flexible time brackets, is a central concern of the Number Pieces cycle. For each of the Number Pieces, this basic idea about time and action is applied to a different situation, or instrumentation – solo, string quartet, concerto, even film – opening up the specific identity of that instrumentation to this broader temporal field. Indeed, the power of the temporal design as such leads to some remarkable qualities of the series as a whole. The notated musical material seems to be reduced to a minimum, all but dissolving compositional signature or idiom into gestures of barest simplicity. If Cage’s chance-based work, for all its disavowing of authorial originality, had always tended to use fairly complicated gestures, audibly derived from the hyper-expressionist styles of musical high modernism, we find in many of the Number Pieces the gestures to be reduced to merely a few sounds, or merely a sound. The works achieve a material almost- anonymity that only few of Cage’s works up to then had5. By minimizing idiom, the written material imposes a much lesser degree of idiomatic or gestural expressive content onto the actions of the performer (compared to, for example, the extreme virtuosity of the Freeman Etudes for violin). Instead, time comes to the fore as a category of musical expression. The variability of the technique, and the minimality of idiom, are extended to the compositional identities of the pieces. On the one hand, the approach has proven to be so strong in itself that it could remain more or less constant while being applied to the widest possible variety of instrumentations, even up to the point of making instrumentation almost interchangeable. For instance, percussion parts often do no longer prescribe what instruments to use; in Four, a string quartet, performers literally exchange their parts in the middle of performance; in the orchestra pieces Sixty-Eight and Seventy-Four only one or two lines are composed, which are shared by many instruments, with the individual inflections that each instrument brings to identical parts yielding a ‘unison of differences’, a rich sound that is a compound of many individual actions. On the other hand, the tendency towards minimality of idiom has its counterpart in the simplicity of compositional decisions, which in fact leads the identity of the piece to be strongly determined by instrumentation. Almost every Number Piece is based on one simple, unique, structural variation of the basic idea6, while the more immediately striking differences between any two pieces are derived from the instrumental set-ups themselves. In a sense, the most important difference between Two for piano and flute and Seventy-Four for orchestra, both being pieces written in two parts and using flexible time brackets, is that Two is for piano and flute while Seventy-Four is for orchestra. Just as gestural signature dissolves into generally very simply defined actions, compositional signature tends towards dissolution into instrumentation as such. In Four, we really do hear merely a string quartet simply playing its basic sounds – but through the lens of a complex temporality. A striking effect of this temporality is a sense of breathing going through most of these pieces, a mostly very slow but consistent motion, sounding almost like an organic meter. Indeed, the brackets tend to be regularly distributed over time, and this defines a sort of implicit very slow pulse, a metrical sense that was hardly a factor in most of Cage’s chance-based works. For instance, in Four, there are consistently two brackets given per minute, ten for every five minute section, with nine of the ten being flexible time brackets and one fixed. The basic ‘gesture tempo’ then is: Bracket = 2 mm. This pulse is not sharply felt, since its articulation in time is governed by the calculated vagueness of the flexible time brackets. This can be understood as a structurally notated, very loose rubato, like an extremely slow version of baroque rubato practices, with the tempo being constant, great internal variability within the meter, and the voices not strictly together, not unlike the way polyphonic harpsichord music is performed. All this makes the music breathe, or seem to dance very slowly. It reinserts a suggestion of interpretative subjectivity into the work of Cage, yet one that is very different from the idea of personal expression of classical music. Instead, the performers dance freely through time, and their subjectivity is only a question of the time structures having opened up zones for the music to breathe in. The most surprising effect of this is that the music tends to sound more ‘interactive’. The sparse gesturality and slow timing of these pieces allow for listening to become a crucial performance element. If only few sounds are played within a relatively wide window of time, a performer can place the sound carefully in context. This results in a much more ‘harmonic’ atmosphere than before, even a sense of counterpoint (rather than accidental simultaneity). Harmony here is understood in a new way, as noticing sounds as they occur together, rather than as a set of rules. The one piece in which this comes out most clearly is Two2 (1989) for piano duo. It was partially inspired by a comment to Cage from composer Sofia Gubaidulina (whom Cage had met in what then was still the Soviet Union): “There is an inner clock”. It is a rare score for Cage, in that performance explicitly depends on listening to what another musician is doing. In each bar a few sounds are notated, which the pianos can play freely; yet a performer cannot advance to the next bar until the other performer has finished playing his or her material. As in Four, there is an overarching ‘measure’ for the piece, given by the unbroken pattern of the Japanese poetic form, renga. There are thirty-six lines, each of five bars, with a fixed sequence of five, seven, five, seven, seven sounds per bar. Thus, as in the other number pieces, a fixed ‘meter’ is interpreted with a very wide range of rubato possibilities, yet the time frame is no longer at the intersection of clock time and action time. The time frame emerges from a collaboration between the two performers, who must listen and react to one another. Instead, it is an intersection of the action timings of two performers: a kind of network time. Thus, in the late work Two2, Cage makes use of the sort of interactive timing that Wolff had been exploring earlier. The work is very much about depending on one another, playing together, listening together, being together. It is about being two. In this history there are three related tendencies, although they occur in changing configurations within specific works. The first tendency is to see composition as definition of potential actions and action grammars. The second is the dissolution of compositional signature and idiom. The third is the emergence of interaction and the being-together of musicians as such as a compositional parameter. The tendencies signal a shift in how musical material is understood, a move away from material as that what is heard, to material as the internal dynamics of events, in excess of their audible manifestation and identity. Likewise, form shifts away from being concerned with sound architecture (“organized sound”) to being an operation on time types. In particular, action grammars delineate temporal fields that have a dimensionality different from that governing the ‘real time’ of performance. Yet their ‘other time’ is a virtual accompaniment to performance time, forming an indiscernible part of it, and the relationship between these different time forms becomes the subject matter of composition. These tendencies underwent further development in work that has followed, and been influenced by, the Number Pieces. Approaches combining clock time and action time in related ways are found in many composers one, two or three generations younger than Cage, including people such as James Tenney, Peter Adriaansz, Michael Pisaro and many others. Here, I will focus on some works by composer, flutist, and publisher of Edition Wandelweiser Antoine Beuger and myself. For Beuger, in any composition, the number of performers is decisive. He speaks of the difference between solo, duo, trio situations and beyond as ontological differences7. Thus, solo music for him is about solitude, somebody doing something all alone, but duo music is about ‘being two’, being simultaneously together and different. To be three is again a different ontology, since relations of commonality and exclusion become possible that were not there with two performers, and so each number has its own characteristic. This thinking suggests the proximity of the Number Pieces, whose very titles imply that the crucial dimension of their instrumentation is, in fact, the number of performers. Yet apart from the titles, Cage seems not to have been primarily concerned with that dimension: the action grammars given by the flexible time brackets, and hence the performance manner, are by and large the same, regardless of ensemble size, with the notable exception of Two2. Precisely this number two, and the quality of ‘being two’, occupies a place almost of privilege among Beuger’s musical ontologies. For according to Beuger, following philosopher Alain Badiou, Two is the number of love. Consequently, for Beuger, each duo composition is an essay on love. Love is a condition of being together, as well as being separated (different). In the earliest duo works to thematize this, Beuger created musical situations in which two performers perform together, but never play at the same time. The composition aus dem garten from 1998, which lasts multiple hours, consists of ten minute brackets. During each of these, in alternation, one of the two performers may play a single sound, the same tone for both, at most once, briefly. The relationship between the performers is only expressed as a shifting of time relationships between the sounds within their brackets, or as their (temporary) withdrawal. A similar situation obtains in ein ton. eher kurz. sehr leise from the same year. Here, the brackets are thirty seconds long, and performers play a sound during each bracket – until, at a moment not determined in advance, one performer stops playing during his or her brackets, after which the other performer continues playing, until he or she, too, stops. Like most of the Number Pieces, these works combine clock time with action time, though the action grammar here is very sparse. One may play early, late, or in the middle of the bracket, or not play at all. The sound may be closer or more distant to that of the other, or it may be all alone, or absent. There is no polyphony. Variable distance and presence become the main expressive parameters in a music of evolving relations, and of simple actions being passed back and forth. There is little, or no, variability of phrasing, articulation, or texture. But without specifying any interactions, these works are designed with great precision to articulate a relationship, essentially insecure and precarious, between two performers, saying something about what ‘being two’ entails. A later series of works was to thematize the idea of ‘being [N]’ more explicitly, and in a less austere style, though still with the same conceptual rigor. This series combines the name of a person to whom Beuger wanted to pay homage with a word indicating size of ensemble. Thus, there are monodies pour mallarmé, ba-da duos, peckinpah trios, cantor quartets, florenski septets, all the way up to ihwe tunings for twenty. In my view, these works are Beuger’s response to the Number Pieces. If Cage’s works showed a dissolution of gesture and signature to reach naked instrumentation, in Beuger, this dissolution continues, with the definition of idiom, gesture and instrumentation giving way to one of potential relationships between [N] performers. Composition becomes an expression of naked number. Thus, instrumentation is no longer specified and gesture reduced to single notes, which are ‘very quiet’ and ‘long to very long’ – an instruction that can be interpreted on almost any instrument. Furthermore, the pitches given indicate ‘pitch zones’ rather than precise pitches. 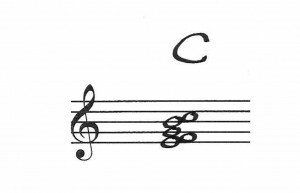 An ‘e’ means ‘somewhere between e flat and f’, and the notes may be performed in any octave. Beuger’s art of notation here is different from the ideal of conventional compositional practice. Instead of specifying what is to be done, the composer is finding ways in which to say ‘just about’ or ‘more or less’. It is a carefully crafted vagueness, indicating a realm of possible events, rather than defining the criteria for some ideal event to occur. This also applies to timing. These works no longer intersect action time with clock time. Instead of clocks, the coordination device has become the page itself. Each page now is one ‘piece’, and during a performance, any number of these may be played in any order. Within each work, the lay-out of the pages, and the way in which they are to be interpreted, are identical, but the specific assignments of pitches to instruments varies. That way, each work in the series defines a single general model for how the given number of performers may perform together, and be related to one another. That model is repeated page after page, as if every page were the ‘scene’ for a musical drama that is enacted over and over again, yet unfolding differently each time. When a particular scene has reached its end, performers turn the page and start the next scene. During this page, the first performer plays one note (more or less an a), the second plays three notes, and the third two. Likewise, on each of the other pages, one of the performers gets one note, one two, and one three. The same drama unfolds with the same roles, distributed differently every time over the performers, and unfolding in other ways. The ockeghem octets are canonic, in homage to Johannes Ockeghem who was a master of the form. On every page the octet is divided into two quartets, differently grouped each time, and each quartet is given the same four pitches (or ‘pitch zones’). On any given page of ihwe tunings for twenty, each player plays one tone from the group of three to which he or she has2 been assigned. Every page proceeds from the same harmonic density, with each of the twelve tones (or ‘pitch zones’) having the same statistically expected presence, yet every time this chromatic whole will appear in different sub-sets, colors, intonations, timings and registers. The action grammars defined through these notations are largely implicit. In most cases, any note could appear at any time, which does not seem to yield a very complex set of considerations. The subtlety of the pieces resides in the fact that the notes can appear at different points related to the actions of the other performers. In the peckinpah trios, for instance, the performer having a single pitch could play it before the others, play it only long after the others have finished, play the pitch between pitches of the others, or together with one or two of the other pitches, with the precise space of possibilities for his or her actions also depending on what the other performers choose to do. In each case, the musical scenario that emerges will be different, and a wide variety of scenarios is possible, yet each possibility is a version of the same, very strict, peckinpah trios idea. Furthermore, since there is no fixed time frame for performing any page, the rhythm of the sounds is almost exclusively in the relationship between performers. All sounds are long to very long, which somewhat suppresses duration as an expressive parameter. Measured by metrical meaning or by clock, all notes would have more or less the same character. What matters, instead, is relation to the others and to the whole: it is whether or not a note enters in a silence, whether or not a chord builds up, whether or not someone plays shorter or longer than somebody else, the way a complex sound peters out into individual voices, whether silences are allowed, whether one plays early or late into the scene. All of these result from the actions of the collective, and it is in relation to all others that all performers choose how to interpret the roles the are given on a page, constantly playing in consciousness of the whole, and carefully calibrating one’s contribution to it. More directly than in the Number Pieces, in which the polyphony is very much bound by clock time, the shape of the phrases is an object of everybody’s actions. Thus, the action grammar defined by the scores implicitly directs the attention of all individuals to their position within the collective. As with the Number Pieces, each actualized version is surrounded by virtual other possibilities. Here, however, since the scenario is repeated over and over, some of those other versions are actualized as well, and the sequence of pages and the act of page-turning makes explicit how every version is merely a variation of every other version. The ‘theme’ of these variations itself is never stated; if anything, it is the carefully crafted ‘more or less’ of the notational style itself, which indicates the shape of a temporal field, that is again and again projected into the ‘real time’ of performance. Projection by projection, the dimensions of this time field are gradually revealed. Thus peckinpah trios ‘is’ a realm of possibilities that is always ‘more or less’ present, but never present as such. Or, it ‘is’ one very basic articulation of the fact that it is these three people who have gathered to play music. The art of composition here is very far removed from the art of crafting highly specific, unique sonic shapes, carrying some expression or other piece of musical information. Indeed, from a brief excerpt, one might not be able to tell immediately which page is being played, or even which of the pieces in the series is being performed (it may be hard to tell the ihwe tunings for twenty apart from the leopold tunings for nineteen by ear). Instead, the compositions are architectures within which a number of people can play together, to experience what it could mean to be that number and those people. They are environments for the group, as indeed is attested to by the titles of some later scores using related principles: un lieu pour se perdre, un lieu pour être deux. Composition dissolves into providing a situation, into being an atmosphere, a place. The page as scene that determines its own time form is a powerful structuring device, comparable to the slow metricity that can be found in the Number Pieces. The kind of ‘rubato’ that it leads to is no longer baroque in logic, however, since the length of the pages could, in theory, be very different; over the course of a performance, accelerandi or ritardandi might occur. As a temporal concept, it is incommensurable with clock time, yet it presents a very strong temporal measurement of its own, one that counts actions, relations and combinations, rather than durations. One need not use the page form for singular, identical scenarios, as in the Beuger series. Inspired by their example, in 2011 I composed a piece that used the page, not to express the variability of a single type of action time, but to contrast two opposed forms of ensemble playing. This was Deux Modèles Simples, originally written for a Pecha Kucha presentation in Montréal, later developed into a stand-alone chamber piece for three or more performers (the ideal number probably being between three and seven). Here, the subject is not the number of performers, but their quality of interaction, which is more explicitly structured like a game than in Beuger’s works. Or, as it is written in the score, ‘a study of micropolitics’. Each of the piece’s forty pages presents five, three, two or one pitches, and indicates an ensemble model, which is either C (for ‘collective’) or I (for ‘individual’). 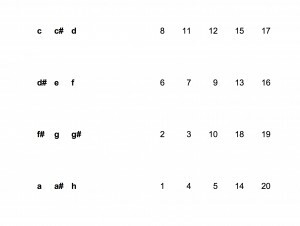 During C-pages, each pitch can be played at most once (in any octave) by the collective as a whole – so if, say, one player would play all notes given, nobody else can play – but during I-pages, each pitch can be played at most once (in any octave) by every individual performer – so that the maximum number of sounds is the number of notes given multiplied by the number of performers. Hence, contrary to what intuition might suggest, the C-pages are sparse, whereas the I-pages can be relatively dense. The structure of the work constantly alternates a sequence of seven pages marked C and having identical pitch collections, with sequences of four pages, having different pitch collections, and marked I. A trade-off appears in this piece between the two models. 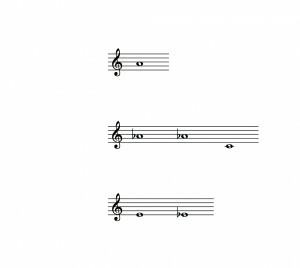 The I-pages tend to sound richer on average, since more notes can be played, as the performers do not need to take the others’ actions into account. The C-pages tend to sound more sparse, but the actions of every performer have consequences for the actions of other performers, since any note played by a performer can no longer be played by another performer, and that leads to a more complex interplay and a different kind of rhythm, a species of network time. During C pages, performers have to listen to one another and supplement each other, or they may ‘steal notes’ from one another, which creates more interaction, more performative tension. In the terms of this essay, two temporal fields of very different dimensions are projected into the real time of performance, leading to a difference in performance attitude and musical quality. It is this shift, back and forth, between subjectivities that forms the real subject of this piece. Complete individual liberty is audibly opposed to collective articulations. The two models of the title are based on rules that are almost identically formulated, yet the musical economies that they produce are incommensurable. Christian Wolff’s later music has equally intrigued and puzzled musicians. His works often seem like piecemeal constructions in which it is hard to discern a logic. Early in 2013, I had the pleasure of being present at the first performance of Dijon (2012-2013) by the French Ensemble Dedalus, who so happened to play it in the town of Dijon. It was a fun experience, a twenty-minute piece that keeps surprising listeners, and performers, by its sudden changes of texture. Looking at the score, it seemed to shift between temporalities almost page by page. Some passages would be in fully-notated counterpoint, other passages would have the indeterminate hocketing figures that are a signature technique in Wolff’s later works, again others would present indeterminate contrapuntal situations in which melodies are given, but the way they are to be combined is not. Almost randomly, the music would shift, and what we would hear would not only be shifts of musical material, but of performance attitude as such. Even though many notes and gestures are heard, these may not be the central concern of this music. To understand such works, one would need to analyze the shifts between time types that appear in them. One would have to determine the dimensions of the time fields determined by the sequence of performance modes, understand how a particular sequence – a particular shift in action grammar – moves one from one subjectivity to the next, and how these grammars resonate with one another. In a charming and elegant way, Wolff’s recent compositions are little studies in discontinuity and dissensus. [...] my idea has always been that as a composer you don’t just write pieces which then are performed in concerts, if you are lucky. What you really (should) do is to invent situations in which people are coming together to hear music. The music then is the centre of the situation and not just included. In case of the very long durations, it is necessary to think of the whole context: people should feel free to leave the concert hall for a while, so there should be a nice, inviting place for them to stay, when they want to take a break, something to drink, to eat maybe. At the same time the stillness of the concert room should be guaranteed, you may want to think about how people are going to be seated etc. So in thinking about the piece, you are really thinking about what the experience is going to be like. And the piece is not just the score or the notes or the sounds, it is the whole context of its performance. When, as some of the composers and musicians associated with the Wandelweiser group have done, one starts thinking about musical forms that can take days, or weeks, or even years, one inevitably encounters different time types that come to intersect with the temporality of the music. Musical form crosses over into other areas of life. Marcus Kaiser, composer, cellist and visual artist living in Düsseldorf, composed OPERNFRAKTAL 21 TAGE in 2003. For three weeks, four people would live in an arts space. Daily, a piece would be performed (either at 6 in the morning, at noon, at 6 in the afternoon or at midnight). Every five minutes, one minute of environmental sound was recorded and played back the next day at the same time, so that gradually the sounds of daily life, of working, of music making would accumulate and proliferate, intersecting the temporal logics of conceptual composition, of ‘normal’ concert practice, and of life. The idea of action grammars and of temporal fields need not only apply to musical actions. Other kinds of concentration have their own time fields with their own dimensions. In a sequence of pieces going back to Motet (2004), I have explored the introduction of the time forms of reading and writing into musical performance. In Essay for Four Voices and Twelve Books (2013), four performers each bring three books for the other three performers to read from. During performance, they all read to themselves, reading certain words, sentences, or passages out loud during one-minute time brackets as given by the score. The time logic intersects clock time with elements of musical improvisation (since often, the words or phrases can be placed very freely within the time spans given), but also with the completely different temporality of reading a text which might be new to you, bringing in rhythms of its own. Such work with reading as part of musical performance has helped me recognize musical structures in unexpected places. In 2011, I was involved in the activities of a group of artists who were part of the Occupy movement in Amsterdam, coordinating a daily reading group, which took place in a tent in the middle of the square on which the protesters were camping. After some weeks of daily discussing texts, it dawned on me that this was, in fact, a situation with a complex musicality. Not only is the reading group format as such a ritual structure, with its own action grammars that involve collective reading, thinking, questioning and debating, it also intersected with the temporal logic of the often chaotic scenes of protesting and camping that were happening outside – not to mention daily life running its course on Beursplein in Amsterdam. These intersections were not merely theoretical, since all these sounds would easily pass through the walls of the tent, and actively influence our reading. All such activities are potential resources for composition, not so much as sound materials, but rather as different time forms that might be made to intersect. In November 2013, the first edition of the Open Source Tribunal was organized by the New World Academy, an arts and politics initiative directed by artist Jonas Staal. The idea of the Tribunal came out of a three-day session, in which art students worked together with radical left-wing expat activists from the Philippines. This was just during the time that typhoon Haynan had devastated large parts of the country, a disaster for which the government of president Aquino seemed very badly prepared. The Open Source Tribunal was formulated as an open platform, a free franchise for use by “any group seeking justice from systematic abuse, persecution or oppression”, to function as a public ritual with both political and artistic dimensions. During the first Tribunal, charges were read against the Aquino government and officially approved NGO’s in the Philippines, charging them with corruption and criminal neglect of responsibilities in preparing for disaster. Three such charges were read by political activists, after which a ‘one person choir’ in the person of composer/vocalist Bethany Younge sang a brief response, a short ￼￼￼￼￼improvisation using simple repetitive vocal figures on key words of the speech just held. Here, the ritual time of a People’s Tribunal was intersected with brief improvisational musical action. The effect was strong. What might otherwise have been a somewhat stiff sequence of addresses gained depth by the intersection with musical time, allowing to reflect on the charges from a different perspective, with a different kind of concentration, letting them sink in. The musical form, largely improvisational, became a resonance space for political speech, transposing it into a different temporal realm. Action time intersects with other temporal economies, be they clock time, page time, reading time or the time of political events and rituals, charting the interactions of different temporal fields, and the way they can be projected into ‘real time’. Indeed, the ‘real time’ of our life is itself a resultant of such interactions between time fields. More generally, musical composition today should not exclusively focus on the esthetic organization of sound as such, or the deployment of some musical ‘language’, or the shaping of precious performance objects for the needs of festivals of new music. It must also investigate time forms, examine the great and incommensurable diversity of action grammars, their combinations and intersections, probing the tensions between them, sounding the indiscernible dimensions of their time fields, to produce charged sonic actions that may create new time forms of their own. 1 Excellent overviews of that can be found in Pritchett’s The Music of John Cage, Cambridge University Press, Cambridge 1993, for instance. Briefly, after rejecting the notion of ‘harmonic structure’ to determine compositional form as taught by Schoenberg (what I would call Phrase time), Cage decided to structure his pieces on the basis of pre- determined time matrices (‘Rhythmic structure’), the ‘cells’ of which could contain both musical materials and silences. Gradually, the musical material to be put in those matrices became chance-controlled, eventually opening up the possibility of a temporal structure that would not be filled with any intentional sounds at all, that is, a pure temporal structure. An excellent online essay can be found on Larry Solomon’s website. 4 Interestingly, some of the most basic elements of this action grammar (‘together’, ‘lasting longer’, etc.) were present from Wolff’s very earliest works as a composer on. Already in Duo for Violins from 1950 for instance, the unit of sound was not understood to be single tones, but as possible combinations in time of two tones. Two tones heard simultaneously are seen as a different sound from two tones of which one lasts longer than the other, and so forth. The definition of the sound units for the piece includes their unfolding in time as a constellation of actions; the action grammar of For one, two or three people expands on this idea. 5 Apart from the obvious example of 4’33”, one might think of the extreme simplicity of the material of the Music for Piano series – simply, piano notes – as a precursor example in this regard. 6 A summary of these ideas can be found on the Wikipedia entry for the Number Pieces. Accessed november 22, 2013. 7 See, for instance, James Saunders interview with Antoine Beuger in The Ashgate Research Companion to Experimental Music, Ashgate 2009; German translation in Antoine Beuger: Werkanalysen und Hintergründe, Edition Howeg, 2013.